HSBC chairman Douglas Flint has failed to take direct responsibility for the bank’s alleged criminal transgressions in Switzerland. He told MPs he should not be subjected to a bonus clawback. MPs ramped up pressure on HSBC on Wednesday by summoning Flint to give evidence to the Treasury Select Committee. The hearing focused on HSBC's allegedcomplicity in tax evasion. It was also attended bythe banking giant's CEO Stuart Gulliver. The Committee launched its inquiry after a string of global media outlets published damning details of 100,000 bank accounts held by HSBC’s Swiss private banking arm. The leaked filesrevealed the bank’s alleged complicity in tax evasion and aggressive tax avoidance between 2005 and 2007. They also shed light on HSBC's practices of doling out large amounts of cash to clients in mixed currencies, and offering banking services to drug traffickers and criminals. As HSBC’s ex-finance director, Flint faced questioning on who was responsible for scrutiny of HSBC’s banking empire between 2005 and 2007. MPs also challenged him on whether the bank's subsidiary in Switzerland was exempt from compliance oversight at the time.The efficacy of in-house HSBC reforms implemented since 2011were also broached. Throughout the course of the hearing, Flint was reluctant to discuss individual accountability for HSBC's practices in Switzerland. Rather, he focused on collective responsibility and HSBC’s internal clean-up. Flint said collective responsibility for governance, management and compliance failures across the banking group must be acknowledged. But he failed to take personal responsibility for HSBC’s actions in Switzerland. The HSBC CEO said the bank’s Swiss subsidiary had let down the banking group’s wider workforce. He stressed senior managers in its Swiss arm bear accountability for HSBC's transgressions in Geneva. He conceded the bank has suffered from“horrible reputational damage”inrecent weeks, but stressed more robust practices for screening clients are now in place in Switzerland.In an effort to downplay scandal surrounding the bank's Swiss arm, Flint stressed only two percent of those who stash money in HSBC's Swiss subsidiary are British. Queried on HSBC’s response to leaked files from its Swiss subsidiary, Flint said the bank’s immediate reaction was to examine weaknesses in its data security measures. He made no reference to an in-house probe.Labour MP John Mann condemned HSBC for focusing on “data theft” rather than criminality uncovered by a whistleblower. Another MP probed Flint on French and Belgian authorities' allegation that HSBC engaged in "serious and organized tax fraud.” Flint declined to comment, but confirmed HSBC is cooperating with the authorities in question. During HSBC's alleged criminal activity, profits at its Swiss arm amounted to two percent of the group’s net profits. Challenged on whether he should forfeit a bonus in the wake of recent allegations leveled at the bank, Flint said he should not. 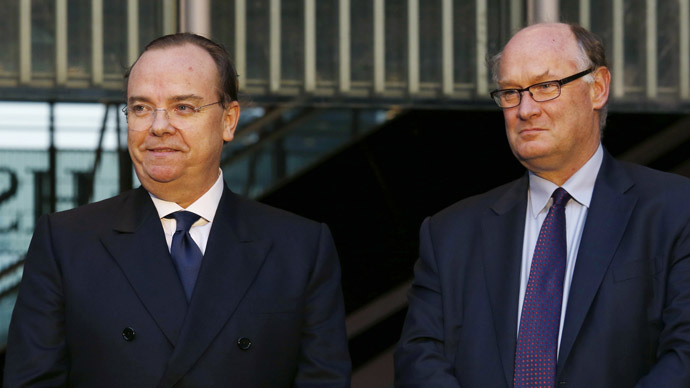 As Gulliver presented HSBC’s financial results alongside Flint on Monday, both men said they were ashamed of the scandal that has engulfed HSBC in recent weeks. Gulliver was initially drafted into HSBC as an agent of reform. However, criticism of his personal tax arrangements has surfaced in recent times. Leaked bank files, dated 2005-07, reveal he sheltered £5 million at a Panamanian firm with his Swiss HSBC account. Another source of controversy for Gulliver is the fact he is domiciled in Hong Kong for tax purposes despite being a UK resident. He has not lived in China since 1990. Gulliver claims he expects to die abroad, and this is the most important factor for determining his domiciliary status. Despite controversy surrounding Gulliver's tax affairs, the HSBC chief told the Committee he sincerely desires to improve HSBC’s banking standards.He also denies allegations of aggressive tax avoidance. #HSBC's Douglas Flint clears things up on whether there were problems with the bank's structure: "It worked very well until it didn't." In the wake of the HSBC tax scandal, serious questions about the bank's overseas practices continue to surface. As Wednesday's hearing came to a close, Flint was challenged by the Committee on allegations made byformer head of compliance in Luxembourg at HSBC’s private bankSue Shelley. Earlier this month, Shelley told BBC's Panorama she was fired 18 months agofor flagging concerns about HSBC’s role in facilitating tax dodging. Challenged on her allegation, Flint told MPs he rejects the claim. He insisted she was not sacked to conceal HSBC’s involvement in tax dodging. However, Flint failed to clarify why Shelley no longer works for the bank. He asked for permission to write privately to the Committee to explain the matter further. Shortly after Shelley's disclosure on Panorama, Britain's Business Secretary Vince Cable wrote to HSBC to express concern at her dismissal from the bank. He also inquired whether HSBC had really cleaned up its practices. The Financial Conduct Authority (FCA) said at the time it will not be investigating the British banking giant. Rather, it will focus on whether the bank has tightened up its internal regulatory culture sufficiently to prevent similar transgressions from occurring again. Britain’s former Director of Public Prosecution, Ken MacDonald, said on Monday HSBC could be liable for criminal charges in Britain. He argued there are reasonable grounds to investigate the bank for “cheating” UK tax authority HRMC.